Next time you visit the Carnegie Museum of Art, lounge in a hammock and talk to Amazonian parrots in a new art exhibit that thrives on viewer participation. The wild, sensory-driven installments of the Carnegie Museum of Art’s new “Hélio Oiticica: To Organize Delirium” exhibition invites guests to traverse sand gardens, serenades them with Brazilian samba music and offers orange juice at the end of an interactive maze. The show, which CMOA opened this past Saturday, is set to be on display through Jan. 2. The exhibition’s five installations, ranging from Metaesquemas — two-dimensional abstract geometric paintings — to interactive environments inspired by Brazilian slums, called favelas, explore the full breadth of Oiticica’s vibrant 25-year career. Oiticica, who lived from 1937 to 1980 and is most known for his avant-garde use of color, was an openly queer Brazilian artist whose work was considered daring for its time. First drawing inspiration from the Neo-Concrete Movement and then transitioning to Conceptual Art, Oiticica broke down barriers between first and third world cultures in his work. CMOA’s “Hélio Oiticica: To Organize Delirium” is the first exhibition to display the full range of Oiticica’s work in over 20 years. In a collaboration between CMOA, the Art Institute of Chicago and the Whitney Museum of American Art, CMOA’s curatorial staff recreated the late artist’s installations based on detailed instructions found in his old notebooks. According to CMOA’s blog, Oiticica believed that leisure is essential to creativity, which is apparent in his 1969 exhibit “Eden.” Participants in the exhibit take off their shoes and relax in a sand garden by reading, meditating, resting or listening to Brazilian music. Bólides, or “fireballs” — luminous box-like vessels with floors made of rocks and leaves — are strategically scattered throughout the installation and burst with energy, making the scene a cross between daily life and art. Along with the “Eden” exhibit in the Hall of Sculpture, patrons can also engage with the Snooker Room, which incorporates a billiards table to create a real-life simulation of a Van Gogh painting, as well as Parangóles — object-like banners and capes made for the samba dancers in the Mangueira favela. Attendees are required to carry or wear the garments and objects and dance around with them in order to convey the political messages they contain. 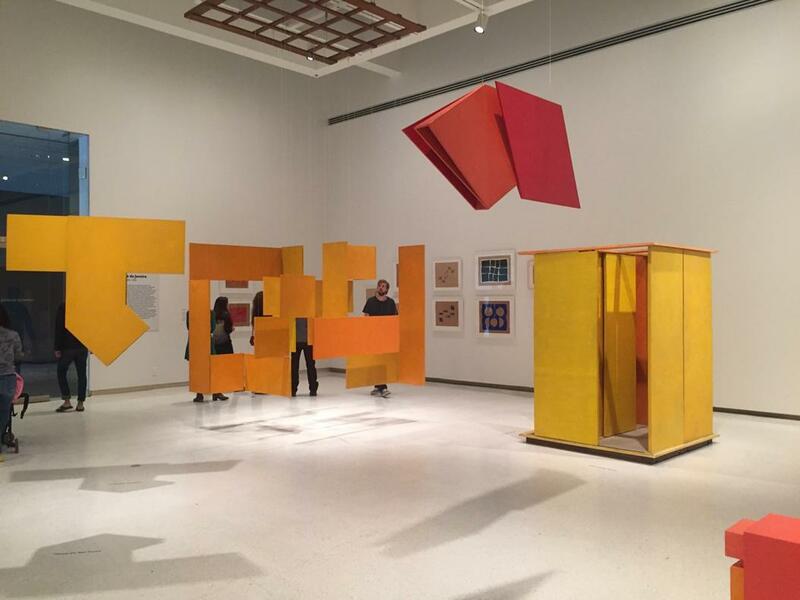 Oiticica’s art in the late 1960s was largely a response to Brazil’s 1964 military coup d’etat, which prompted a discussion amongst Oiticica and his contemporaries about the relationship between art and society. Oiticica was one of many Latin American artists at the time who rebelled against the bourgeois ownership over art and called for a social re-dedication to the masses. Both the Filter and Tropicália installations feature Oiticica’s portrait of Brazil during a time of political turmoil. “Filter” — a maze with colorful, translucent Plexiglass walls — forces the participant to see the world through a colorful lens. This makes for an interesting juxtaposition to the reality of governmental control in Oiticica’s Brazil. To further induce the suffocating feeling of being stuck within the maze, the Filter installation is comprised of a variety of different curtains that block the participant’s path, simulating the classism citizens faced in Brazil during the time period. A spacious display of Oiticica’s more colorful and living artwork lies within the confines of the Tropicália installation. Bright yellow and pink geometric shapes are suspended from the ceiling, teeming with illusory movement that brings his art to life. The installation explores Brazil’s “fake paradise” through incorporated “Penetrables” — colorful structures resembling makeshift homes in Rio de Janeiro favelas — two live Amazon parrots in a large metal cage, potted fake plants and a pathway of stones through a sandy interior environment. Because Oiticica’s work centers around socioeconomic anxieties and fear of big government, it’s worth noting the timeliness of his exhibition displaying during a contentious election cycle when the future of America’s middle and working class seems most vulnerable. In a swing state, both the right and left will most likely find Oiticica’s criticism of Brazil’s controlling government thought-provoking, despite the 4,000-mile remove. His experimentation with film and photography — which offers a glimpse into his drug use as well as his sexuality and New York’s queer art community — produced works such as the CC5 Hendrix-War installation. In this room, participants can lay in hammocks and watch projected photographs of Jimi Hendrix, face streaked with cocaine, while his music plays in the background. According to CMOA’s website, this is the first museum to explore Oiticica’s New York years in depth. The art within the last installation — PN27 Rijanviera — featuring a garden of sand, pieces of asphalt and rocks — was created after Oiticica returned to Brazil, a year before he passed away from a stroke. He envisioned the piece, according to CMOA, when he felt more at peace with both his sexuality and his country, as conveyed through the structure and calm, natural colors of the work. After watching children playing around in the sand of Oiticica’s exhibits, it’s easy to see why he believed that art should be interactive and available to the public — the immersive, participatory factor is still inclusive and internationally engaging, even 36 years after the revolutionary artist’s death. Lexi Kennell is a junior English Writing major in the fiction track. She primarily writes about music, film and visual art.